Dark Horse is no stranger to publishing art books based on video games and The Art of Recore continues that tradition. Inspired by the newly announced Xbox game ReCore, Dark Horse Books presents this comprehensive volume examining the art and inspiration behind the game’s mysterious and dynamic world. 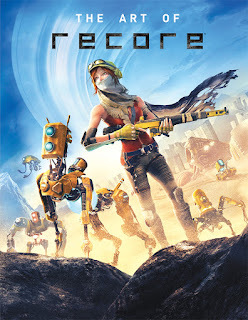 From legendary video game creator Keiji Inafune and Armature Studio, the team behind the Metroid Prime series, comes ReCore, an action-adventure game masterfully crafted for the modern generation. Gamers can play as Joule, one of the last remaining humans, and forge friendships with courageous robot companions to lead them on an epic adventure through a mysterious, dynamic world. Available as an Xbox Play Anywhere title starting September 13, 2016. The Art of Recore will feature commentary from the game’s creators in a beautiful 112-page hardcover collects hundreds of pieces of never-before-seen art. The essential companion to the highly anticipated game! FOR IMMEDIATE RELEASE: MILWAUKIE, OR— Dark Horse proudly announces the latest video game art book in its long line of best-selling, award-winning titles: The Art of ReCore. Inspired by the newly announced Xbox game ReCore, Dark Horse Books presents this comprehensive volume examining the art and inspiration behind the game’s mysterious and dynamic world. From legendary video game creator Keiji Inafune and Armature Studio, the team behind the Metroid Primeseries, comes ReCore, an action-adventure game masterfully crafted for the modern generation. Play as Joule, one of the last remaining humans, and forge friendships with courageous robot companions to lead them on an epic adventure through a mysterious, dynamic world. Available as an Xbox Play Anywhere title starting September 13, 2016. Featuring commentary from the game’s creators, this beautiful 112-page hardcover collects hundreds of pieces of never-before-seen art. The Art of ReCore is in stores fall 2016. Preorder your copy today at your local comic shop! Check out the official ReCore site here to learn more about the game.